Back in the early 1990s, Nissan was on top of the world. The Yokohama-based company was building incredible sports cars like the 300ZX Turbo, the 240SX, and the R32 GT-R. 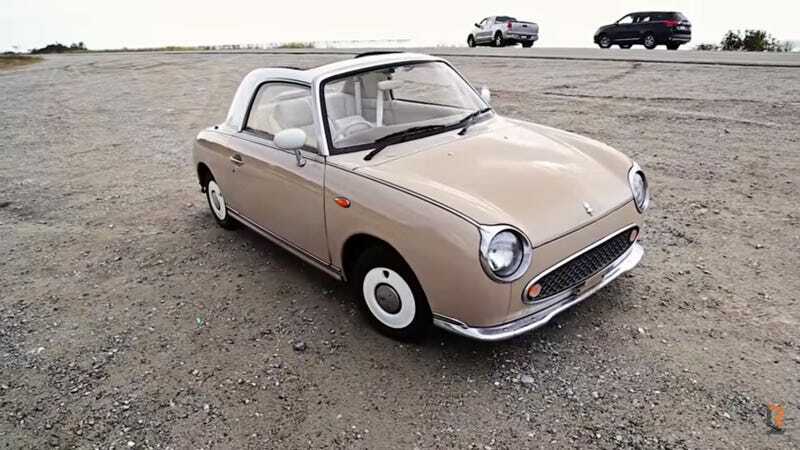 In their home market, they also released a series of cutesy small cars based on the sub-compact Nissan March, including this quasi-sports coupe, the Figaro. The Figaro is basically like the cooler version of Jason’s Pao, and the Roads Untravelled folks got their hands on one to figure out if it was any good. Where Nissan’s sports cars were aspirational and world-beating, the Figaro derived its power from a 987cc turbocharged inline-four, and unfortunately all of them received a 3-speed automatic transmission. While it has retro sports car good looks, weights only 1800 pounds, and has an opening top, it doesn’t have the most inspiring driving experience. With a thin steering wheel grip, a small 2+2 layout, and a ton of body roll, the car’s throwback driving experience is more than skin deep. This was retro-futurist well before Ford ever dreamed of reviving the Thunderbird on the back of a Jaguar. I really like them, but it doesn’t seem like this guy does.